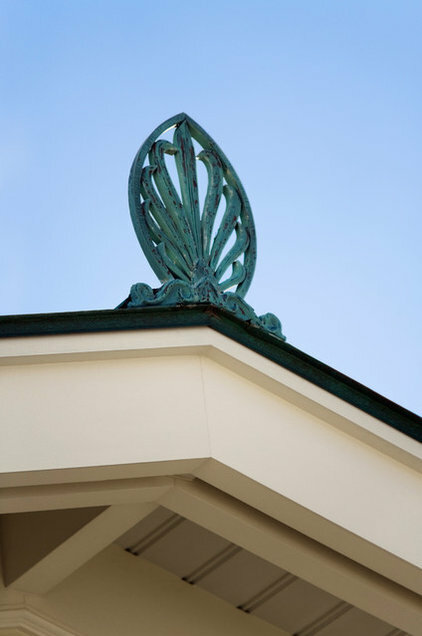 Architectural detail gives a house interest, texture, depth, a story and so much more. And while detail can liven up and enrich our experience of a home, it often isn’t thought about until the end. So what happens is that a crown molding gets added as a surface treatment that, while maybe nice, doesn’t seem to have a relationship to the overall architecture. Or a colonial-style balustrade gets installed alongside an Arts and Crafts trim. The trick, then, is to think about detail early in the design. And while this doesn’t mean that you’ll want to obsess unnecessarily about each and every detail early on, you’ll want to have an understanding of how each detail will enhance and reinforce the architecture. The two houses here, both very different stylistically, offer some insights into how the careful consideration of details can enrich a home’s story. 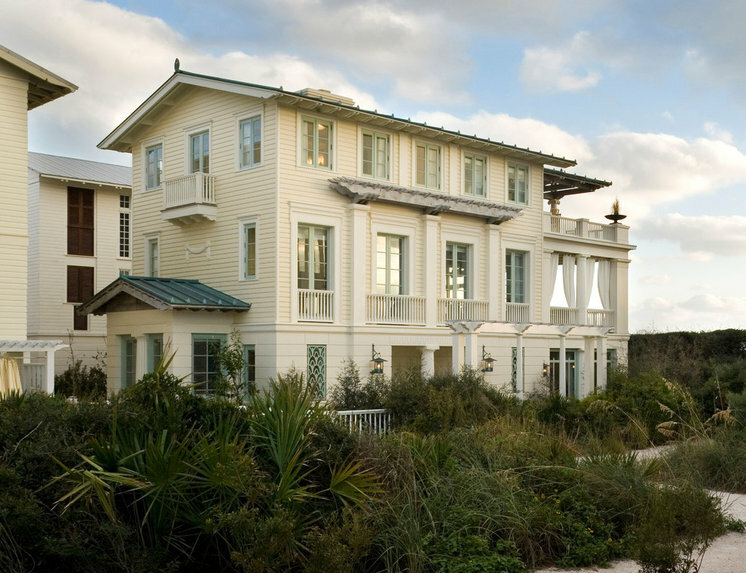 This house in Seaside, Florida, is an example of how all the details about materials, color, texture, light, shadow and decoration were considered early in the design process. 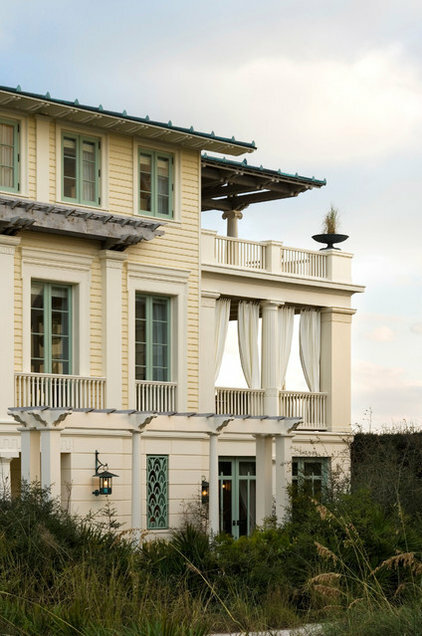 It’s clear that Gary Brewer, a partner at Robert A.M. Stern Architects, wanted to employ the language of high-style classical architecture, such as classical columns and pilasters. But he also wanted to create something light, bright and open for this beach setting, so he included more casual touches, such as the pergola over the upper porch and the rafter tails at the eaves. What results is a home that is both formal — the result of a certain amount of symmetry and classical detailing — and quite livable and relaxed. Inside, painted panels from a design by Brewer and painted by Andrew Tedesco hide a TV above the fireplace (its garlands echo a similar motif used on the exterior). The wall paneling is something we’d expect in a beachside cottage, as well as the colors, which are soft, gentle and soothing. 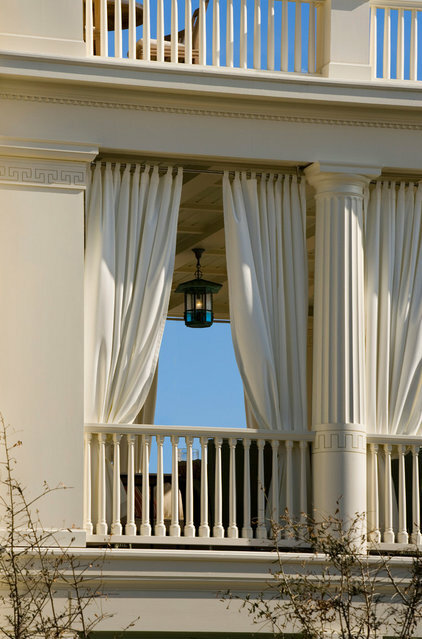 The upper porch features balustrades in the form of little columns and a Greek key pattern etched into the wood columns and trim. While the overall architecture communicates strength, solidity and permanence, the curtains are transient, movable and relaxed. 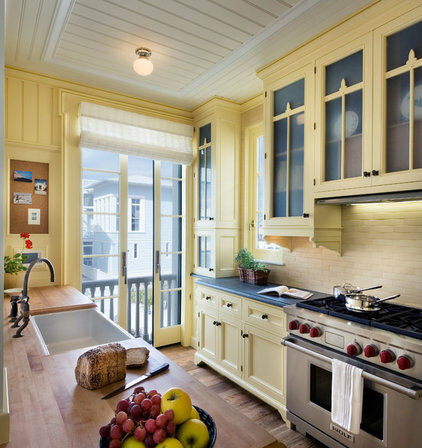 … to the kitchen, seen in a decorative detail on the glass-front cabinetry. And what would a beach cottage that is inspired by classical architecture be without urns with bright fires burning for passing ships to see? But in this case, tall sea grasses replace fire in a copper urn so the idea is constant even though the detail of the material has been changed. Richness of detail isn’t just for those houses in a traditional style. In fact, a modern aesthetic in many ways depends on details that enliven and enhance the overall appeal of the structure. As such, the same tools are employed to add detail. Texture, material, color, light and shadow create details that, as in the traditional house, tell a compelling story. The rich detail in many more contemporary aesthetics is the result of expressing how connections are made and pieces are assembled. 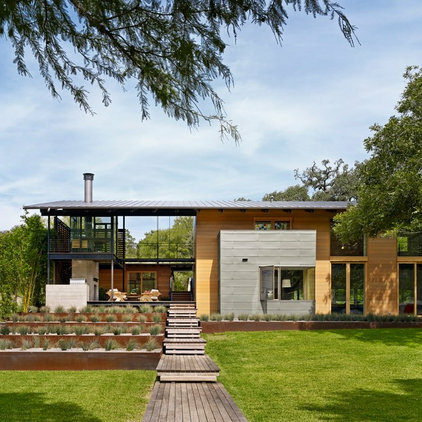 The steel post seen in this Austin, Texas, home is an integral part of its design, and the bolts at the steel beam connections have been made visible. 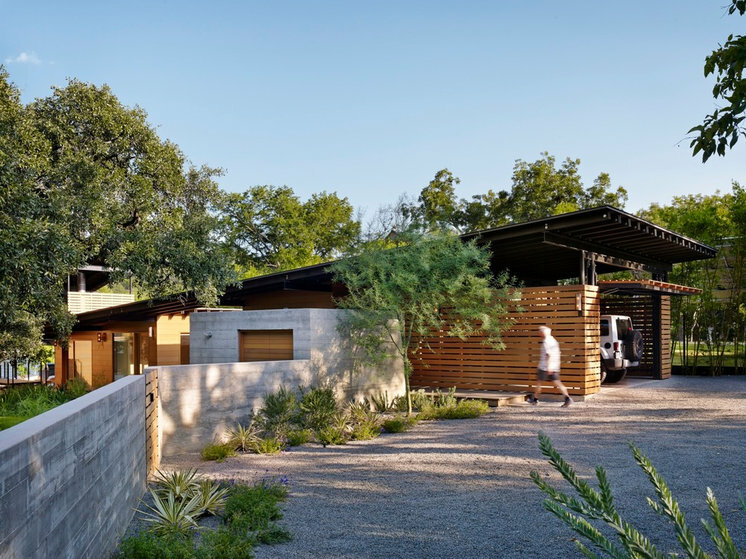 A path from the parking area into the home stretches over an aboveground lap pool. 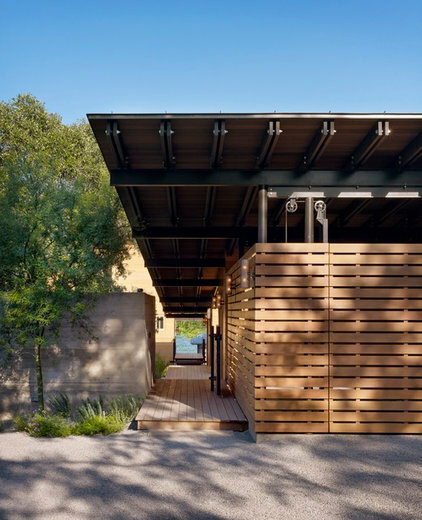 The structural elements of the bridge and walkway’s suspension aren’t hidden in walls or ceilings but have been left open to show us how the house was made. As in our first example, the more traditional house, the details are consistent throughout. 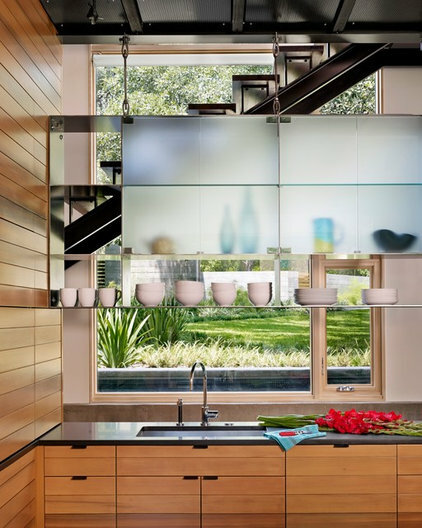 Even the kitchen’s cabinetry — steel shelves with frosted glass panels — is suspended, and the way it is hung has been made evident. The concrete walls defining the parking area show the marks of the wood used to form their shapes. Even the system of pulleys and counterweights that raises and lowers the garage door is detailed. Not your standard ceiling-hung operator, the system of pulleys and chains is visible, so we know exactly how the garage door is controlled. 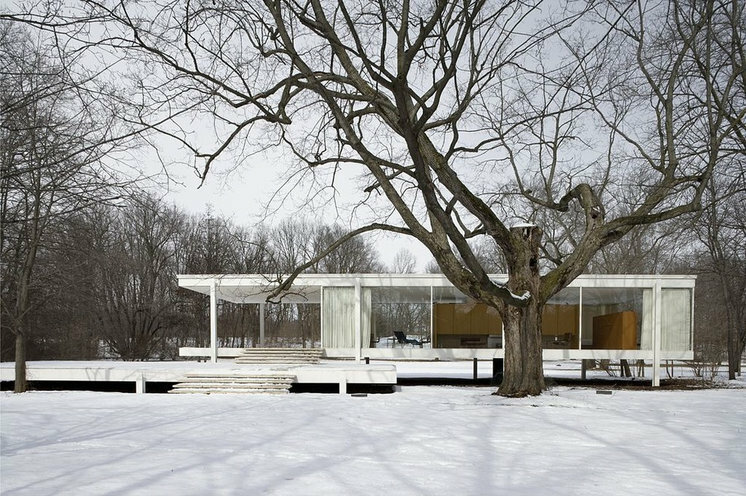 As that great modern architect Mies van der Rohe acknowledged, “God is in the details.” So when you’re thinking about and designing your new home, be it new construction or a renovation, carefully consider the details and how they can enrich its story.